If tumblr is a bellwether—and it may not be—then the sixties & seventies are back, in style if not in substance. So many of tumblr’s weird little blogs, each of them a kind of eclectic personal bulletin board, feature this kind of rock and roll Hair: The Musical meets back-to-the-land handmade-house thing. 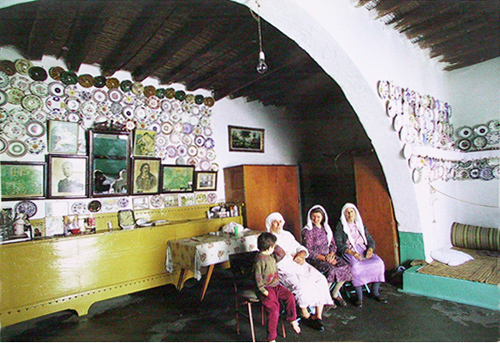 There is something so beautiful about the way photographs and other objects are hung on the walls in traditional rooms in Greece. The objects are prized yet there’s also something casual and unprecious about the way they accumulate. The variety of frames is appealing, and so is the way shapshots are collected inside a single frame.